San Diego (September 23, 2018) It’s been a Finn filled weekend at the San Diego Yacht Club with two back to back Finn regattas: the Finn Pacific Coast Championships (Sept. 15-16) and the Finn Masters North American Championships (Sept. 21-23). 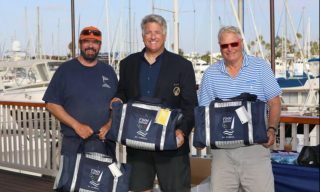 This weekend, the Finn Masters North American Championship hosted 29 Master Finn sailors (age 40 and over) eager to compete on the beautiful Coronado Roads situated just south of Point Loma which juts out into the blue Pacific Ocean. What else can you expect from a September day in San Diego but mild temps and clear, sunny skies? This weekend was that! With a cool breeze ranging from 8-12kts, sailors from all over the country raved of the amazing conditions in SDYC’s tucked away home of Point Loma, California. The top Master was Darrell Peck/Child’s Play, grinding through four of the eight races in first place. His worst race and discard was a seventh. Behind Peck were two amazing sailors, SDYC’s Commodore Michael Dorgan/Finnster in second and second overall from last week’s Pacific Coast Championship was Rob Coutts/Priscilla in third. While he might have made his success look effortless to his peers, Peck did experience some equipment problems on the course when his tiller universal was damaged in Sunday’s races. Thankfully, the Race Committee tossed Darrell some duct tape, he mended his broken piece and stayed competitive. The real excitement grew in the battle for second with Dorgan and Coutts. The two were tied at the end of Saturday (day two out of three). Despite Coutts bullet in the final race, Dorgan’s consistent 3-2 for the day put him two points ahead of Coutts for the regatta. “I had to have a great start and sail fast upwind to compete against Rob’s speed downwind. I tried to sail a conservative race and stay next to him the whole time. In addition to a great race neck and neck with Rob, it was an honor to finish next to Darrell Peck,” explained Commodore Dorgan. Each day of racing ended with evenings filled with delicious food, great music and good camaraderie. On Friday, the sailors enjoyed music by SDYC Junior Director John Fretwell’s band Stylus Overhang. Saturday, they relaxed with good beer by one of the sponsors, Ketch Grill and Tap, around a bonfire, and Sunday, concluded with a wonderful awards ceremony. Commodore Dorgan ended the weekend with a comment on the fleet and the Masters. “It’s gives me great satisfaction to see all these guys sailing and having fun and using their boats. The most important thing for a Master is to be active, sailing, competing, and to be out in the fresh air enjoying God’s gift: the beautiful Pacific Ocean. Next for the Finn fleet is the San Diego Olympic Classes Regatta (SDOCR) on October 6-7, 2018. This will be the third and final regatta of the Finn Trifecta happening this fall at San Diego Yacht Club. For more information or media inquiries, please contact Casey Allocco. The San Diego Yacht Club encourages and fosters an environment that helps and continues to produce the best in the world of boating-related activities. Founded in 1886, SDYC has become a world renown sailing community recognized for its success in bay sailing, ocean racing, cruising, angling, and its world class youth sailing program. SDYC is consistently ranked among the top 5 yacht clubs in the U.S. and is recognized by the Club Leadership Forum as one of the finest facilities of its kind in the world.